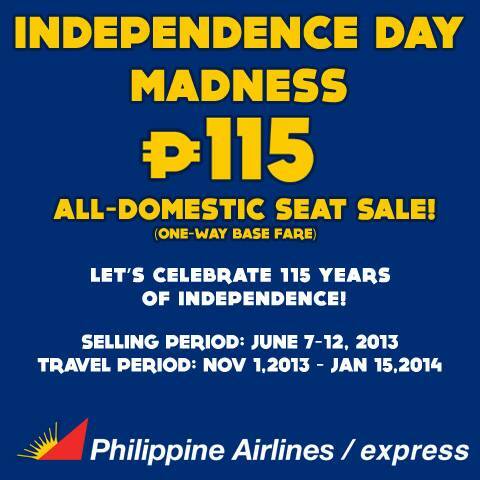 Philippine Airlines Promo 2019 - 2020: Pal Promo 2014: Independence Day Seat Sale! Pal Promo 2014: Independence day ticket sale! Your most trusted airline gives you the freedom to fly anywhere in the country for only P115 one-way base fare! Check out http://www1.philippineairlines.com/special-offers/independence-day-madness/ and http://www.flypalexpress.com/Independence-day-madness for more details. True deals and great value are right here with Your Home in the Sky! *Offer good for limited seats only, so hurry and book soon!